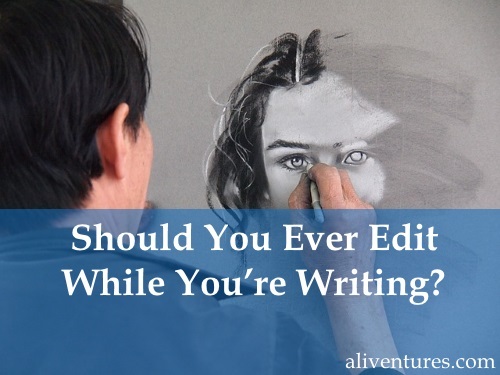 Should You Ever Edit While You’re Writing? A lot of writers will insist that you should never, ever edit when you’re writing. You can even use software that disables the backspace key, or that starts eating your words if you don’t type fast enough (Write or Die). Personally, I think a rather more balanced approach is fine! If you’re writing a novel, it’s almost inevitable that you’ll end up writing something you later change your mind about. You might include a scene, for instance, that you later decide to cut or radically change. Try not to go back and make those changes while you’re still drafting. It’s easy to get bogged down taking out scenes (or entire characters!) – at the expense of forward momentum. I don’t think I’ve ever written a novel draft that didn’t involve massive changes between Draft 1 and Draft 2, especially in the early chapters. I’ve got a novella on the go currently, and while that was easier to draft than my longer novels, I’ve still ended up cutting two early chapters of material going from Draft 1 – Draft 2. When I first drafted Lycopolis, there were all sorts of things that had to change. I cut out two characters, for instance. So I could get through to the end of that draft, I didn’t go back and change the chapters they appeared in until I’d finished the whole thing. Make notes about what you want to change. You may want to add notes into the relevant chapters. Keep writing as if you’d already made those changes. No-one ever needs to speak of those to-be-excised characters again! But … if you really feel that you can’t go forward until you’ve “fixed” things, ignore all the above. Go back, make the changes you need to make, then plough on forward. Writing a novel is a messy process and you don’t always have to do things the most “efficient” way. I mentioned this earlier: it’s fine to go back and fix a typo while you’re drafting – if you want to. Personally, I find typos and spelling mistakes incredibly distracting. I’d much rather take the two seconds to fix them than to try to write on, gritting my teeth and ignoring them! You might feel differently. When I was studying creative writing at Goldsmiths, I had a tutor who said he drafted without worrying about punctuation – he just added it all in afterwards. That wouldn’t work for me, but it obviously suited his workflow. Set a timer and challenge yourself to write as fast as you can. Some writers find a timer too pressuring, but I find it can be almost liberating: when I’m focused on speed rather than precision, I can just go for it! Turn off your monitor (or close your eyes) while you type. This only really works if you can touch type fairly accurately – but it can be a great way to push yourself to focus on going forward, rather than on looking back. But … ask yourself whether you’re happy to stay as you are. Maybe you never move on till your sentence is just how you want it … but you rarely have to edit after that. If you’re happy with what you’re producing, and with the speed at which you produce it, then why change what works? I have to admit that “plan your scene before you write” is one of those excellent pieces of advice that I don’t always manage to follow! When I do, though, I find it really does help. I’m sure lots of different writers have advised something similar, but the person who really sold me on this idea was Rachel Aaron, in her post How I Went From Writing 2,000 Words a Day to 10,000 Words a Day. If you want to avoid writing scenes that meander, that don’t advance the plot, and that eventually get cut or seriously edited, then spend five minutes planning before you write. Rough out what’s going to happen in the scene (you might include snippets of dialogue too). You might even want to close your eyes and try to “watch” the action in the scene as if it’s playing out on a scene in front of you. Try making it a habit or a ritual. Every time you sit down to write a scene, spend five minutes jotting down a rough plan for what’s going to happen. Batch together your plans and create several at once. This is what I do with blog posts – and it works really well for me. I plan two, three, or four posts at a time, then when I want to write a post, I just grab a plan and get going! You might want to do something similar with the next few chapter of your novel: have a “planning” session, then a bunch of “writing” sessions. But … sometimes, you do need to give yourself permission to simply do some exploratory writing. You might see this as a form of pre-writing: something you do as a warm up, or as a tool for generating ideas. Even if you don’t keep those words, they’re not wasted – they’re part of the process of writing. Ultimately, your writing process is unique to you. It’s up to you to figure out what works: how can you produce your best work, without wasting time? Whatever you do, though, be deliberate about it. If you’re going to edit as you write, make a decision about how exactly that will work best for you. If, like me, you want to get that first draft done as quickly as possible, have a plan for how you’ll keep it at least more or less on track! Do you tend to edit as you write or is it a habit you largely avoid? What one thing could you do to make better forward progress with the draft at hand? I’d love to hear your thoughts in the comments. Crafting and editing a post is really very important before hitting the publish button. In early days of blogging i used to edit my post several times. But I started practicing to write 1000 words daily and its reduces my editing time and keep my post ready to publish with few edits. Thanks for sharing these awesome tips here. Vishwajeet Kumar’s last blog post ..Fastcomet- SSD web hosting with Premium Support. Thanks Vishwajeet! I think writing regularly is the very best way to improve (and to get faster). I definitely do less editing these days than when I first started blogging. I also write lots of whole scenes out of order. I suppose you could consider that planning—but it’s really just writing whenever the muse strikes! Also, those scenes that are written way ahead of time very rarely make it to the final draft. Bottom line is, I find I have to *trust* my characters or the writing doesn’t work. I can’t drive them, I have to let them drive themselves. Ah, I just can’t get my head round writing out of order, though I know it works perfectly well for many writers! Of course there’s no one “perfect” amount of planning — and if not planning works for you, that’s absolutely fine. Agreed. It’s funny—it’s as if I literally *can’t* plan. I actually planned this one scene involving two of my main protagonists, but then as I was writing it, it totally didn’t go according to plan…that scene was when I discovered that one of my characters, interestingly the most subdued of them all, is really quite a wildcard. She’s been responsible for a lot of plot twists. She surprises me every time. Sometimes it takes me a while to get “into” a character — they seem bland or flat, then at some point (sometimes chapters in — sometimes a couple of drafts in! ), I figure out a new aspect to them and they really leap into life for me. I think knowing the ending is always helpful! With my novels, I generally know how they start, how they end, and a few major scenes or high points along the way. That is a good line. 🙂 I’m sure I’ve stolen plenty of things from Star Trek without realising (I was a bit obsessed in my teens … I had a full size poster of Spock on the back of my bedroom door)! As a blogger, I believe it is a matter of what suits the individual writer. I like to edit as I go and I find it does not interrupt my writing flow. In fact, by editing as I write, it saves me time, because we all have to edit at some point. However, I am stating what works for me and not every writer. Different strokes for different folks! Sometimes I edit a chapter after done writing it. Sometimes I don’t. But the hardest part about editing is finding the stuff that doesn’t move your story forward or is just dragging your plot. It is hard to delete these because they may be beautifully written.